Attendez-vous à être agréablement surpris. Excellent séjour. Appartement propre. Propriétaires très réactifs. We had an amazing stay in Reims at Olivia and Vincent's. They are truly nice people and very helpful. Their hospitality is much appreciated. This also reflects in the room we stayed in. Clean, practical, looked nice and tidy. Definately the place to stay for a trip to Reims. Bon soir, Olivia et Vincent! Merci beaucoup for the stay and a wonderful first-time experience of airbnb. 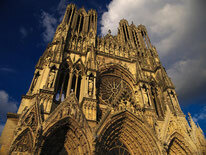 I will most definately visit Reims another time. We really have no complaints about our stay. Merci encore et au revoir! Cordialement, Thomas. L'airbnb d'Olivia et Vincent est parfait : accueil chaleureux, informations sur les activités à faire dans les environs au top, propreté, équipement, design et emplacement. Rien à redire, c'était génial. Our group of 8 stayed in 4 different apartments for a long weekend. We found it great to have the larger Le Loft apartment so that we could gather there as a group. The apartment is a short walk from the main shopping and eating areas and only a 3 minute walk to the RER train station. Olivia & Vincent were very quick to respond to any of our needs and very helpful in ordering taxis. They have refurbished the whole building themselves and it has unique touches of decor and design. Overall I would recommend these apartments to a large group, or individuals looking to rent a single apartment. Thank you for your quick communication and being available to help us order taxis! We had a great stay and would recommend your place to others. We hope to come back in the future! Though it was a quick stay, it was a great one - thank you for the hospitality! Parfait merci pour ce séjour nous reviendrons sans hésitations !! Appartement duplex très agréable et bien décoré. Des hôtes attentifs qui font tout pour faciliter votre séjour. Olivia and Vincent’s apartment was amazing - we can’t praise it enough - close to good restaurants and easy to park - and the bistro theme is stunning. The communications were perfect throughout - we even received tips about where to have an ideal champagne aperitif - super service. We had an absolutely wonderful time in your apartment - we loved the quirky space. And thank you so much for your helpful tips and hints. Great host and a great place! Close to the center of Reims. Beautiful clean apartment! Cozy, comfortable apartment within walking distance of many local restaurants and shops. Also within 20ish minutes of Epernay, for the champagne tours and tastings. The bed was very comfortable and the patio was the perfect place for coffee in the morning. Le logement est très propre. Une décoration soignée à la fois moderne et vintage. Proche du centre ville. Tout simplement on s'y sent bien. Je vous recommande ce logement si vous voulez découvrir Reims. Excellent weekend à Reims. Un loft magnifique avec une décoration à la fois très moderne et vintage. Proche du centre-ville. Je recommande vivement et je y reviendrai dès que possible. Merci beaucoup Olivia.